Ah, the temptation of waist training at night. It seems like such an easy way to accelerate your progress. A full six to eight hours of downtime and you’re not going to be doing anything except sleeping so why not slim your waistline while you’re at it? Plus, waist training at night allows you to sneak in extra training, which is especially great if your day-to-day activities make it difficult to wear a corset during the daytime. Not to mention that it’s a fairly effortless way to maintain your perfect hourglass figure after you hit your waist training goals. It sounds like a no brainer and for many women, waist training at night works likes a charm. But for others, it’s nothing but an uncomfortable way to lose a night of precious sleep. So what’s the difference? Here’s a few factors that will affect how much you’ll love – or hate – waist training at night. Is Waist Training at Night a Good Fit for You? We humans are a unique bunch. Despite the fact that all humans are 99.5% genetically similar to any other humans, there’s still so much variance amongst us. Are you a light or heavy sleeper? If you’re the sort of light sleeper who finds it difficult to fall asleep when there’s a smidgen of light, the faintest sound, or the slightest movement…waist training at night is probably not going to be the best fit for you. But if you’re a heavy sleeper, you’ll find it a lot easier. Heck, you might even find it to be comfortable and relaxing. What position do you sleep in? Some sleeping positions simply make waist training at night a lot easier. For example, if you sleep on your back, wearing a corset throughout the night will be a lot easier for you. On the other hand, if you’re a tummy sleeper, you may experience more discomfort both during the night and throughout the day since corsets restrict your spine from curving as it naturally does when you’re in a prostrate position. That puts additional pressure on your neck which can translate to stiffness and headaches during the day. Side sleepers can find wearing a corset at night equally uncomfortable since corsets require you to keep your muscles engaged which poses a bit of an issue when you’re trying to totally relax and drift off into oblivion. But even if you’re a fairly light sleeper who likes to sleep on her tummy or side, that doesn’t mean you have to completely ditch nighttime waist training. There are a number of helpful tips you can put into practice to help you slumber your way to an hourglass figure – without sacrificing your sleep. Many women successfully sleep in their corsets while others declare their beds a corset-free zone after trying it a few times. So what’s the difference? Know how, baby. It all comes down to knowing how to pull it off. Here’s a few tips to get you dozing comfortably in your corset in no time at all! When your body is sleeping, your parasympathetic system becomes more active, which slows your heart rate and shifts your blood flow and energy away from your limbs and into intestinal activity. This is a good thing intended to help you with digestion but it can cause discomfort, bloating and even acid reflux or heartburn when you’re wearing a corset at night. Also, your core muscles relax completely in deep sleep, which can make the corset feel tighter during the night than it does throughout the day. So when you’re strapping in for the night, go ahead and loosen your corset an inch or two to allow for the extra blood flow to your gut as well as the muscle relaxation that occurs when you sleep. You want a looser, more comfortable fit for your nighttime waist training adventures. The easiest way to do this, especially if you’ve been waist training for awhile, is to simply designate one of your “old” corsets that you’ve outgrown outslimmed as your sleeping corset. They may not provide enough pressure to be useable during the day but they certainly come in handy during the night and allow you to put some pressure on your waistline while minimizing discomfort. If you’re brand new to waist training and have yet to accumulate any old corsets, you might want to consider getting a lighter, shorter corset for the night. Baby corsets and ribbon corsets don’t cover much of your stomach, reducing discomfort, while cinching your waist so you get the training benefits as you sleep. Yet another option is to get a single boned corset or a corset with no boning. These are a lot less restrictive and also prevent any annoying “poking” throughout the night. They say you should learn to walk before you run and in waist training, this translates to learn to nap before you sleep in your corset. The easiest way to get yourself comfortable with waist training at night is to test it out with a small nap. This allows you to observe what feels uncomfortable and make adjustments so you can eventually sleep through the night in your corset. One of the first things you’ll notice when you start waist training is that you visit the restroom more often. This happens when you wear a corset at night as well, which obviously does not result in the most peaceful sleep. To prevent having your slumber interrupted with frequent bathroom runs, limit your liquids as you get closer to bedtime. Things happen when you sleep. You roll over, shift, toss, turn and often wake up in a very different position from the one you started out in. The last thing you need is to be caught in a tangle of laces when you roll out of bed in the morning, right? So tuck those laces into your corset before you doze off. For every sleeping position, there is a way to cleverly use pillows for ultimate comfort. If you’re a back sleeper, you can help maintain the natural curve in your back for a more comfortable sleep by tucking a small pillow – a memory foam half moon pillow is the best – or a rolled up sheet or towel under the small of your back. If you’ve struggled with acid reflux when sleeping in a corset, use a wedge pillow to provide extra elevation for your torso and prevent stomach acid from crawling back up your esophagus. For side sleepers, you’ll quickly notice that when you lay on your side, there’s quite a gap between the bed and your side. 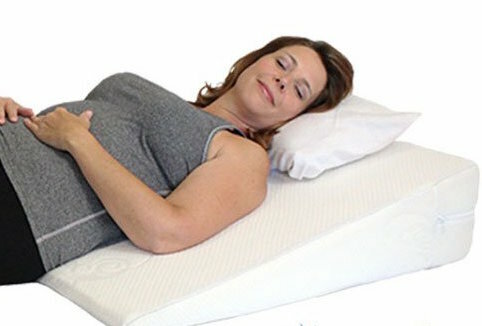 An easy way to provide support is to use a bolster pillow – again, a memory foam half moon pillow is great for this – to fill the gap between your waist and the bed. Another clever trick for extra side-sleeping comfort is to place your back toward the wall and use a flat pillow between your back and the wall for additional support so you don’t have to balance on your side the whole night. Adding an additional knee pillow to tuck between your knees also significantly takes the stress off your hips and spine. If you’re a tummy sleeper, the best pillow is probably no pillow at all or a really flat pillow. A good option is to opt for a blanket or a towel that you can mold into any shape – that provides some elevation for comfort without putting undue stress on your neck. 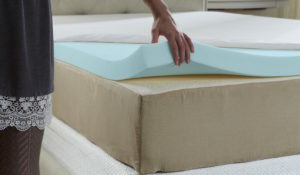 A memory foam mattress topper is also a good option for tummy sleepers since these allow your body to sort of sink into them, which lowers the tension on your back and neck. With these tips in your waist training arsenal, chances are good that you’ll have a restful night of sleep while slimming your waistline. But the most important thing to keep in mind is to always listen to your body and do what’s best for you. If sleeping in a corset causes undue stress – physically, mentally, or emotionally – take it off! A good night of sleep trumps an uncomfortable night of half-a**ed waist training every time.